Electronics have long been available for boats. They help chart courses, monitor depth, search for good fishing grounds, and make you more conspicuous in low visibility conditions. Over the past decade, the advances in technology with smaller, handheld devices have translated well to boating electronics. Though not every vessel needs every bell and whistle, there are a number of handy systems out there today that work well, depending on the size, location, and use of your boat. Here is a breakdown of some handy examples. What They Do: Chart plotters are an electronic replacement to the marine charts that have been used to navigate for centuries. They have an advantage over paper charts in that they are usually hooked up to a GPS signal and can show you your place on the water. 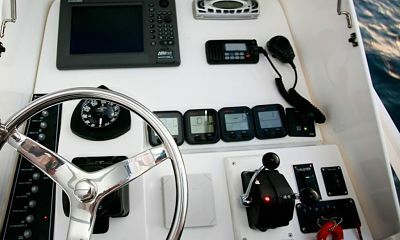 Many chart plotters come with combined features that allow you to use other electronics with them as well, such as tide and current charts, radar, depth sounders, and fish finders. What They Cannot Do: Chart plotters do have disadvantages as well. GPS signals can get you close to a certain point, but they can be off by 50 feet or more. Because of this, it is still important to pay attention. Best Kind of Boat on Which to Use Them: Any boat that is large enough to leave near shore areas can benefit from a chart plotter. What They Do: Depth sounders are used, unsurprisingly, to tell you the depth of where you are. This can be very handy in areas with large rocks or other underwater hazards. It can also help you navigate in a region with a large tidal exchange, as the actual depth of an area can be ten feet or more off from what a chart shows, depending on the tidal height. Fish finders use a sonar signal to determine if there is something solid below the water. They are great for locating larger schools of fish, as well as wrecks and reef formations for divers. What They Cannot Do: Depth sounders alone can tell you if it is deep enough to moor in an area, but they cannot tell you if that will remain the case. A localized tidal chart is also necessary to be sure that the anchorage you have found at your perfect cove will not leave you grounded in the morning. Fish finders are great at telling you that there is something below you. However, it takes a lot of experience to tell a school of salmon from a very dense population of plankton. Best Kind of Boat on Which to Use Them: Many older boats have only depth sounders. 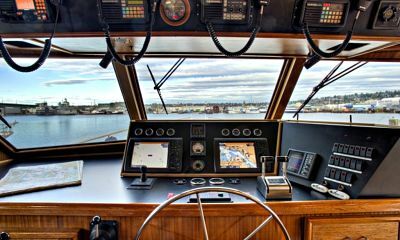 However, more modern boats often have a combined chart plotter and depth sounder. This is not necessary for small, open skiffs used for fishing, though chart plotters can be useful for marking fishing hot spots, and many fishermen prefer the combo. Because of the risk of running aground, both sailboats and powerboats will find depth sounders useful. What They Do: Radar works much like your fish finder, but instead of telling you what is below you, they tell you what is around you. This is particularly useful when you are traveling in the dark or fog. If you boat in an area with commercial shipping lanes, it is a nice safety precaution to protect you from being surprised by large oncoming vessels. What They Cannot Do: Radar cannot pick up all navigation hazards. Submerged rocks, most logs, and smaller non-metal boats like canoes and kayaks go typically unnoticed by radar, particularly at a distance. Radar also cannot alert other boats to your presence, unless the oncoming boat has its own radar system. Best Kind of Boat on Which to Use Them: Radar is most important if you are traveling long distances, near shipping lanes, or in low-visibility conditions. They are most handy for powerboats, because right-of-way rules and speed of travel make it more likely that an oncoming vessel will require them to alter course. What They Do: Fuel flow meters are used to determine the rate of flow from your fuel tank to your engine. When charted with rpm, it gives vessel users an idea of the most efficient engine rate for a boat. When used long-term, fuel flow meters can help save costs at the pump. They can also cue a boat owner in to potential engine issues before they become too costly by showing a change in efficiency. What They Cannot Do: Fuel flow meters are not a gas gauge. They cannot tell you how full your tank is. Best Kind of Boat on Which to Use Them: Vessels with engines that are used regularly can benefit most from a fuel flow meter. Commercial charters, commuter boats, and other daily-use boats can save a lot of fuel costs by installing these handy gadgets. What They Do: AIS, or the vessel Automatic Identification System, gives each boat in the system a transponder that constantly broadcasts the direction, speed, and name of a vessel. This is very handy if you want to hail a boat over VHS and are too far to read the name. It also is a step above radar in telling you the direction of travel and destination of large vessels, instead of just locating them in space around you. This system can also make you more visible to other vessels, if you have a boat that is not easily seen by radar. This makes travel in low-visibility conditions much safer. What They Cannot Do: AIS can only tell you the information about boats that are on the system. This includes all commercial shipping traffic. Best Kind of Boat on Which To Use Them: Vessels that are regularly traveling among commercial shipping traffic, and boats that travel in more risky areas and want the safety assurance of being easily found by the Coast Guard can benefit most by this system. What They Do: Autopilot works by keeping you on a pre-planned course. Simple systems will keep a compass bearing, while more complex versions can keep a boat on a charted path, and correct for the wandering caused by side-winds and swells. This is particularly handy during long passages with few people, as it allows the captain to take a break from steering into winds, and helps ensure that you reach a destination that is not readily visible with little error. What They Cannot Do: Autopilot is not a substitute for a captain. It cannot see nor steer around obstacles or other vessels. It is also not recommended during storm events. Best Kind of Boat On Which To Use Them: Boats that are taking long journeys with hours of driving will benefit most from an autopilot. Both sailboats and powerboats will find them beneficial. What They Do: Night vision goggles and cameras allow a vessel to see obstacles in low-light conditions. These systems range from goggles to binoculars to bow-mounted cameras. The systems rely on infrared technology to “see” in the dark, and can help vehicles steer around logs and other hazards at night. What They Cannot Do: Infrared goggles cannot see through fog, only dark. They also are limited to a very localized distance, so they cannot tell you of obstacles that are more than a few hundred feet from your vessel. Best Kind of Boat On Which To Use Them: Vessels who regularly travel in low-light conditions in water that is known to have navigational hazards will benefit most from night vision technology. This includes pleasure boaters taking long-range trips and traveling day and night. Because of the damage that can be caused by their speed of travel and the risk of tangling lines into propellers, they are most beneficial to power boaters. What They Do: Wireless alarm technology is one of the most exciting new systems for boats today. There is an alarm for just about any function a boater can imagine, and wireless technology means that they can be programmed to text a cell phone to let them know of a change. This is not just a burglar alarm, like in cars and homes. Boaters can receive a text if their bilge pump stops working, or has been running for an hour or more. They can get texts to let them know that their boat’s GPS location has shifted more than 100 feet, clueing them in to the fact that they may be dragging anchor. They can also program their smoke and carbon monoxide alarms to send a text if they go off. What They Cannot Do: If a boater can imagine it, there is likely someone who can program an alarm to do it. Best Kind of Boat on Which to Use Them: As the cost of these systems drops to that of a good smartphone app, there are few boats which would not benefit from some of the alarm technologies today. Any boat which would find this technology handy is a good choice for this technology. Depending on your budget, there are many electronics to choose from. When deciding the best choices for you, it's important to consider the size of your vessel, the boating conditions in your area, and your budget. Some of the more expensive items are nice, but may not be necessary for the kind of boating you do most. If some of these things sound perfect for you, but are a little out of your price range, consider watching for used and sale items. If they're still a little costly, be patient. Technology tends to become less expensive over time, so it may be just the price you're looking for in a few short years.